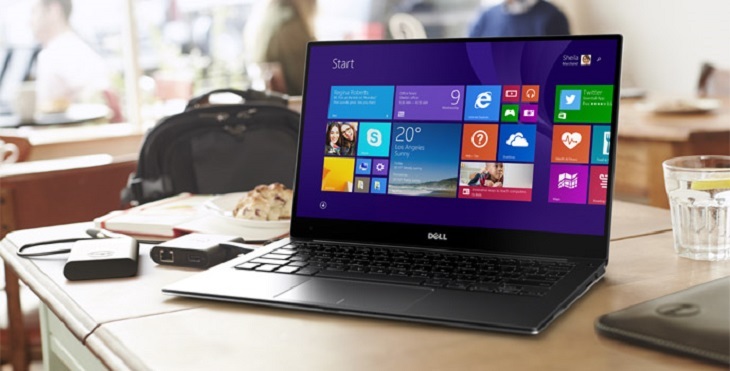 One of the most interesting new notebooks so far 2015 is the Dell XPS 13 9343. This ultra-thin laptop stands out with its near bezel-less “infinity” 13.3-inch display with either Full HD (1920 x 1080) QHD+ (3200 x 1800) resolution and touchscreen support on the QHD+ models. Technology behind the panel is IGZO, offering wide viewing angles like those on IPS-based panels. Furthermore, display brightness is rated at 400 nits, meaning that it is very bright and suitable for outdoor use. The screen is strapped by edge-to-edge Corning’s scratch-resistant Gorilla Glass. The thin bezel has enabled Dell to squeeze the 13.3″ screen in a chassis of a 12-inch laptop, making the XPS 13 9343 highly portable and easy to tote around. The “infinity” display is accompanied by a chiclet keyboard with backlight and a single-piece trackpad. The keyboard deck is made of carbon fiber in black color, while the lid is constructed of silver-colored aluminum. Overall, the chassis is very slim, measuring just 0.35 inches at the thinnest and 0.6 inches at the thickest point. The laptop is very light too, measuring 2.6 pounds. Under the hood, the Dell XPS 13 9343 packs one of the latest 5th Gen Intel Core Broadwell processors. It can be either the i3-5010U or i5-5200U mid-range dual-core CPU, depending on customers’ choice. Storage space is either 128GB or 256GB large and is based on solid state drive-type devices. RAM memory size is 4GB or 8GB. The display is managed by the Intel HD 5500 non-gaming graphics integrated in the Intel CPUs. Sound is powered by stereo speakers, while video chats work with help of a 720p web camera. The cam isn’t built into the usual top display bezel, because of it thinness. It is located in the lower left corner of the display panel instead. Regarding networking and connectivity, the Dell XPS 13 9343 features 802.11AC Wi-Fi wireless, Bluetooth, two USB 3.0 ports, a mini DisplayPort for external monitors, and a 3-in-1 media card reader. According to Dell, the sealed 52 WHr 4-cell battery can provide up to 15 hours of battery life on models with Full HD displays, while QHD+ resolution reduces the maximal battery life to still impressive 11 hours.